When it comes to household dangers it’s often things like flooding, tornadoes, and hurricanes that get all of our attention. While these dangers should never be understated, fire can actually be one of the more devastating things that can happen to your home that is all to commonplace. To make matters worse these fires typically happen from mundane events like cooking. Fire safety should be a priority in your home. While the number of fires has dropped by nearly 20% since 2006, there was still 1.3 million instances of a property catching fire in the United States alone for the year 2015. This resulted in over 3,000 deaths, approximately 16,000 injuries, and over 14 billion dollars in damages. Despite having some of the strictest electrical and building codes in the nation, countries like Texas, California, and New York are leaders in the nation for the number of fires. Danger of fire is surreal as it can cause severe third degree burns and it can cause death if the body is left in the heat for too long. Home fires occur across the world and careless actions and accidents are the leading source. Elderly and people of color are particularly affected. While no property can be completely fireproof, there are many prevention measures that you should put in place to make sure your home doesn’t catch fire. From here it’s also important to have a plan in case of a fire – keeping just a few things in mind can one day save your life. The best way to survive a fire is to prevent it in the first place. Identifying the potential fire hazards in your home should be your first step. Most obvious is anything that throws off a great deal of heat – these items should have a safety bubble of at least three feet between them and other objects. Space heaters, fireplaces, and ovens especially have to keep this in mind, as they can produce hundreds of degrees of heat at a time. Try to use your common sense when it comes to portable heaters – don’t use one of these machines that are too large for your area, and always turn them off when not in use. If you’re a smoker, you should never smoke in bed or really in your home at all. When smoking outside be aware of things like gasoline, oxygen tanks, and other explosive items. Those candles may be pretty, but never let a candle burn overnight or left unattended. All lightable items – candles, lighters, and matches – should be out of reach of little hands. Gas should never be added to a fire, and the gasoline itself should be stored in a sealed container. Be wary of things like bleach, ammonia, chlorine, and other volatile chemicals as they become explosive if mixed. Smoke alarms should be stationed throughout your home – but it doesn’t matter how many of them you have if the batteries are dead. So make sure to go around and change the batteries every couple of years. The smoke alarms themselves should be replaced when they become a decade old, as their parts are too worn down to be relied on. 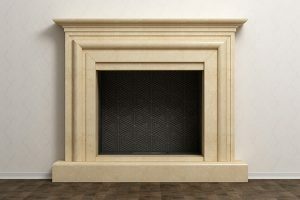 Fireplaces are beautiful but are also one of the leading causes of fires in a residential property. 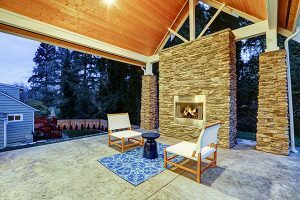 Safeguarding your home against a home fire with a fireplace is just as simple as performing a mental checklist once every few months. Any erosion in the form of cracked or worn down bricks should be fixed as soon as possible. If you notice any rust along the grates, peeling wallpaper, or water damage in your home around the chimney or fireplace, then you might have a crack or hole in the structure of your chimney. Keeping your chimney clean is one of the most important things you can do to prevent a fire. An unclean chimney can build up creosote, which can ignite from the smallest ember and create a chimney fire. These chimney fires can burn several hundred degrees or more and last for days. If you have a gas fireplace make sure the burners are kept clean, as a dirty burner can create a volatile fire that can ignite the foundation of the firebox. 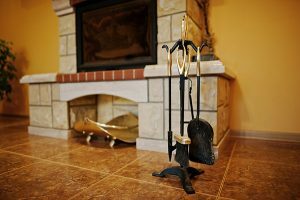 You should have a certified chimney sweep come in and check out your fireplace and chimney at least once a year for basic cleaning and to check for any needed repairs. If you’re getting a fireplace installed to make sure it’s with a certified professional. 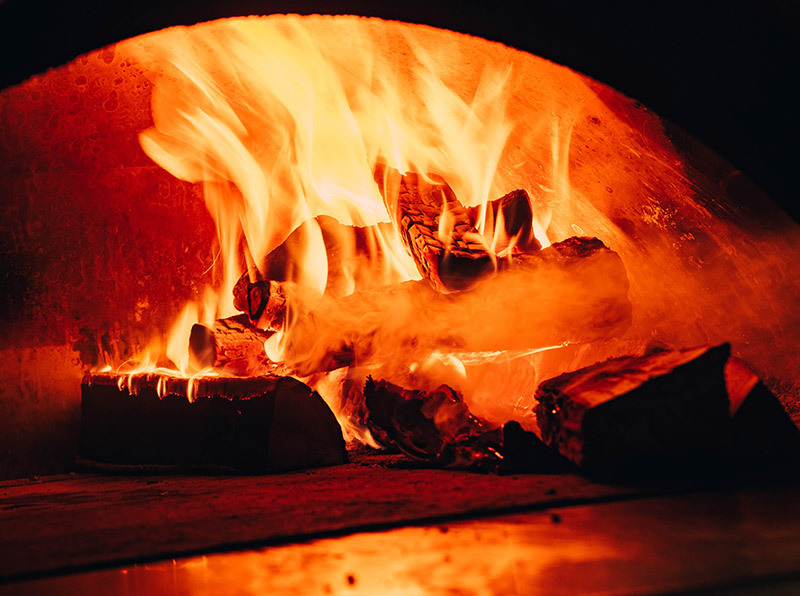 Ideally, the firebox to flue ratio should be ten to one – in other words for every ten inches of diameter of your firebox, there should be one inch for your flue. 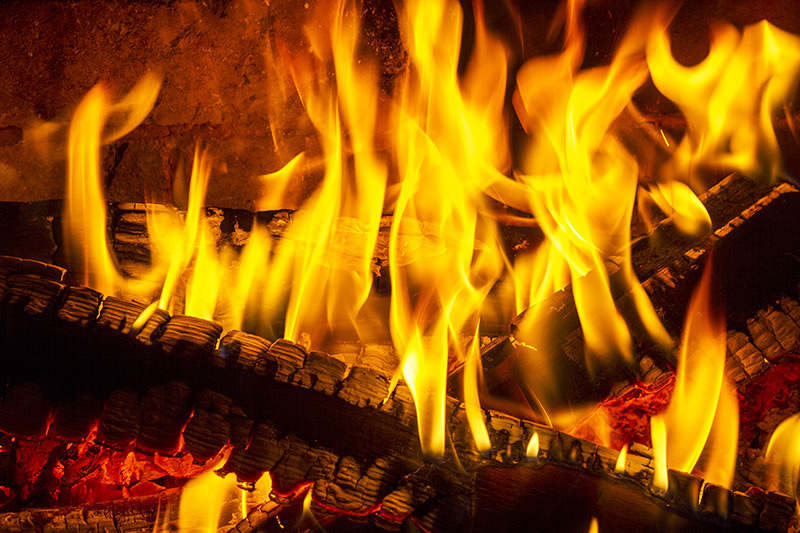 When using your fireplace make sure to only use certified firewood that has been properly dried out. Never use gas or other firestarter products to light your fireplace as this can turn explosive. 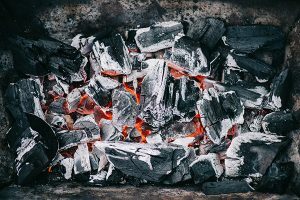 Make sure to push the metal grates all the way back against the far wall of the firebox, and always use a gate to keep smoke and debris from getting into your home. As mentioned before, no home can be completely fireproof. Even the most careful of homeowners can find themselves in a mighty conflagration in a matter of moments. Because of this, it’s important to know what to do in the possibility of a fire as it could be a matter of life and death. If you find yourself in a fire, remember to never open a hot door. A warm door temperature can indicate that there’s a fire on the other side. If you find yourself in this situation you need to locate a secondary exit. If you’re on a second story and are unable to get down, then grab something white to use as a flag to signal for help. If you find yourself stuck in a room try to keep everything sealed and as close as possible – always keep doors close and fill in any of the cracks around it if you can. When moving through a particularly smokey room stay low to the ground to avoid any smoke inhalation. It’s important to stay as light as possible – leave everything behind as your things are replaceable but your life isn’t. When you get out to make sure to call 911 and never go back in. Everyone in your home should be able to get out in less than two minutes. It’s best not to find out if they are capable on the day of a fire, so try to go over exits and practice runs beforehand. Make sure everyone also knows the basics of stop, drop, and roll in case their clothes ever catch fire. If you need any temporary housing, food, or medicine In the aftermath of a fire make sure you contact your local disaster relief, like the Red Cross. It’s also important to contact your insurance company to see what you need to do. To say fire safety is important is an understatement, as a fire can have devastating effects on your home, family, and life. Safeguard your home against the threat of fire by identifying hazards in your home and neutralize them as best you can. While they can be annoying from time to time, you should have a smoke alarm installed. Particularly safety should be taken around your fireplace as there are a plethora of problems that can go wrong and cause a fire. Nobody wants a fire, but if you find yourself in one make sure to keep a cool head and quickly, but carefully, make your way out of your home. Since 1985, the most trusted chimney service company in the Chicagoland area has been Early Times. Our professional chimney and fireplace solutions start with our experts who can inspect your chimney for any residue that can cause a fire. Speak to a professional today and get a free quote.